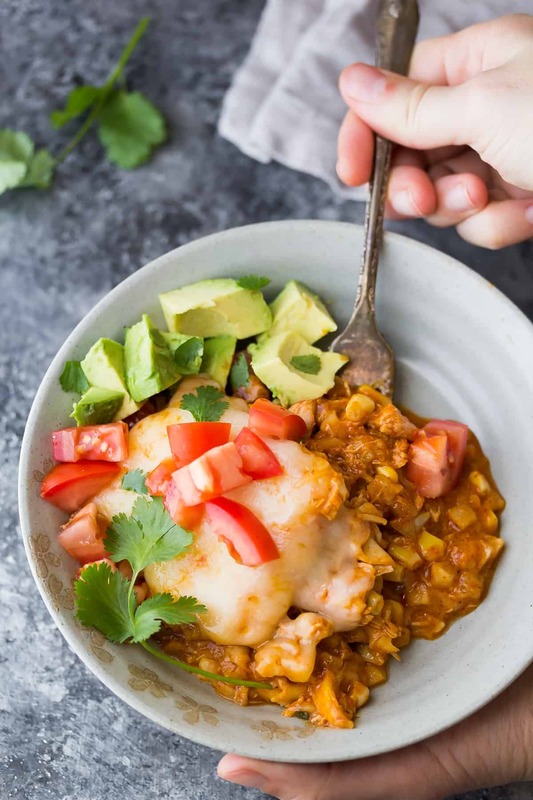 Cauliflower Rice Chicken Enchilada Casserole is a lower carb version of a favorite comfort food! Just six simple ingredients required. Say hello to my new favorite friend, this cauliflower chicken cheesy goodness you see above! He’s been to dinner on more than four occasions in the past few weeks, and has not even close to worn out his welcome. He totally fits the bill on ‘comfort food’, but is hiding a healthy secret: cauliflower! 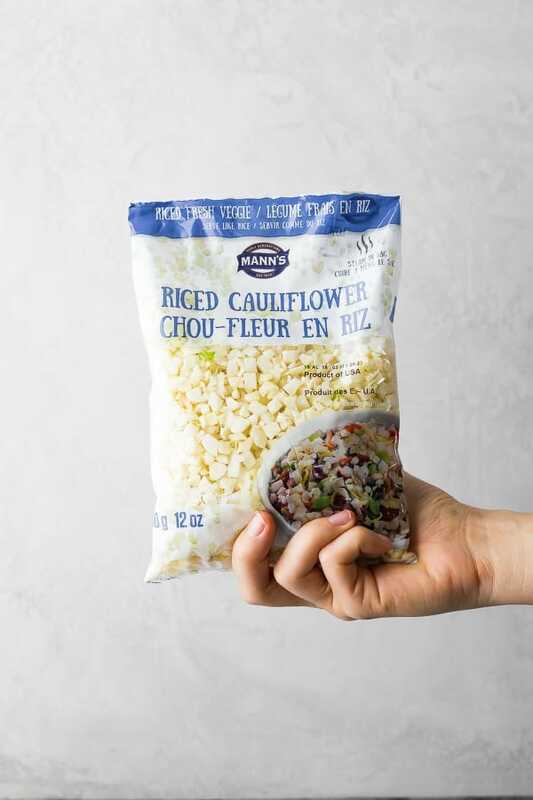 Have you seen Mann’s Riced Cauliflower in your grocery store? These little cauliflower chunks are insanely versatile: use them as a rice substitute, add them to your stir fries, healthy breakfast sandwiches, make cauliflower pizza crust or bread sticks…you name it. Not only are they incredibly useful, but they cut down on food waste. Everyone wants the tops of the cauliflower, but how often do you consider the stems? I love this way to repurpose ‘unwanted’ food. 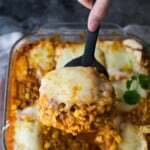 To showcase how versatile this cauliflower rice is, I decided to use them in a chicken enchilada casserole, in place of rice. 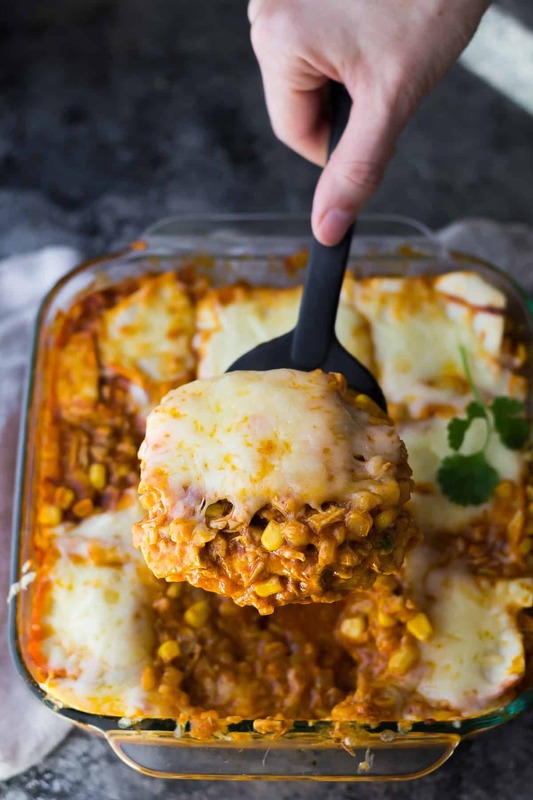 This chicken enchilada casserole couldn’t be any easier to prepare. You simply combine steamed cauliflower rice (just pop the whole bag in the microwave for 2 minutes! ), with corn, chicken, enchilada sauce and some cheese. 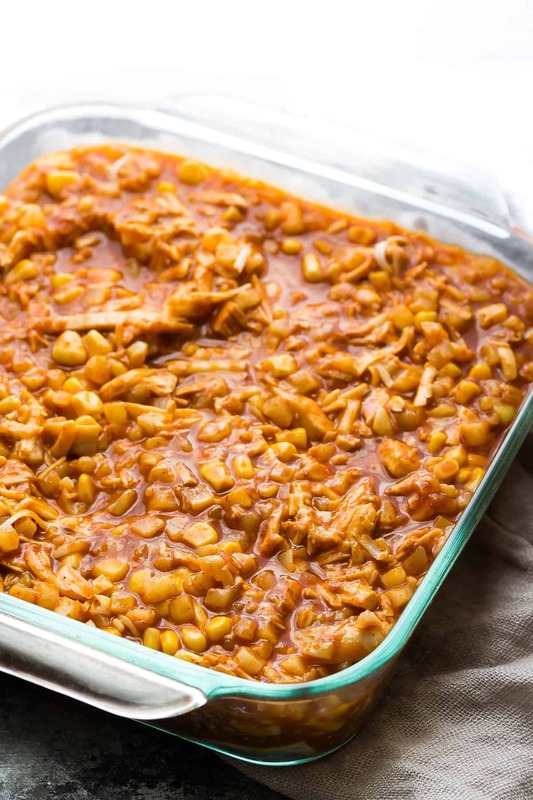 Cover the bottom of a square pan with tortillas, then top with the filling. Add more tortillas, then some cheese, and bake away for 30 minutes. Can we be honest here? I always shy away from casseroles because they look like so much work. This casserole has shattered those illusions. Total number of ingredients in this casserole? Six. Total prep time? 10 minutes. Seriously easy. It can be our little secret. You know what else can be our little secret? How easy it is to make…I made you a video to prove it! Thank you to Mann’s for sponsoring this post! As always, all opinions are my own. Thank you for supporting the brands that support Sweet Peas & Saffron. 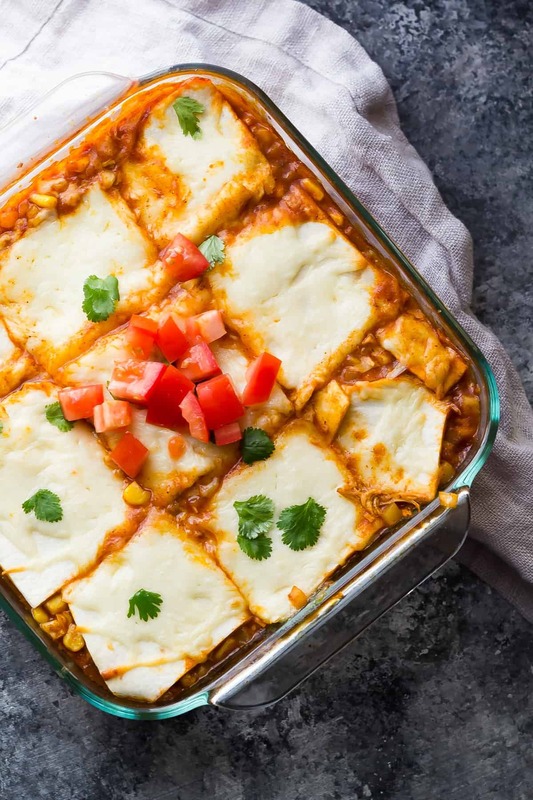 You may also like this Mexican Spaghetti Squash Casserole! Microwave the riced cauliflower (in the sealed package) for 2 minutes. Allow to cool slightly before opening the bag and adding to a large bowl. 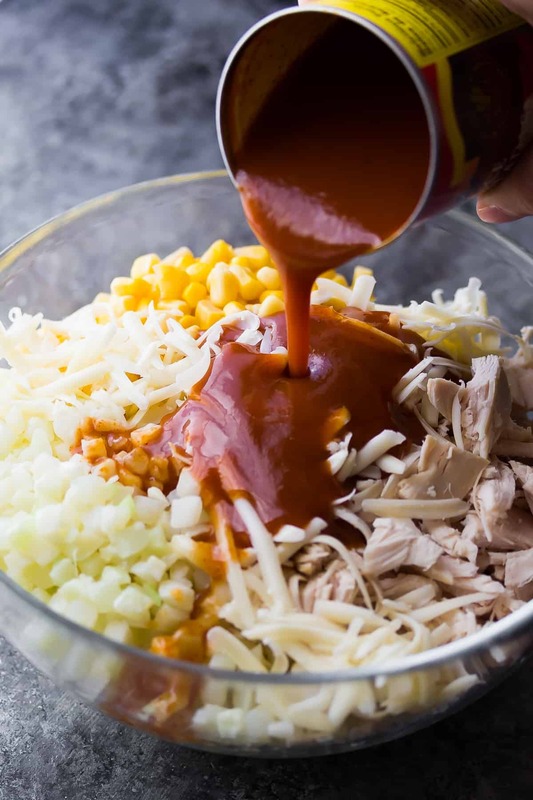 Stir in the corn, enchilada sauce, chicken, and ½ cup cheese (optional). In the bottom of a 9x9 inch baking dish, place four of the tortillas, flat side to the outside of the container. Add two more tortillas on top, then sprinkle with 1 cup of cheese. I could eat this dish multiple times in a week. It is SO beyond easy, full of flavor, filling and absolutely heathy. I am trying to drop pounds right now. This meal tasted like a cheat, but it really wasn’t. I made two smaller dishes instead of using a large dish. In one, I used gluten free corn tortillas, and the other I used whole wheat low carb. I did add some green chilles for a little kick. Thanks so much for sharing this! Hi Linda! I’m so happy you and your husband enjoyed it! Thank you so much for taking time out of your day to leave a review. I made this last night and it was delicious! I added a small can of chopped green chiles and I used an extra small can of enchilada sauce because we are big sauce fans in our family! I also used corn tortillas instead of flour because that’s what enchiladas are made with. It was simple and tasty! And I love how easily it came together. We’re having the leftovers tonight because it made more than a 9×9 pan. That was just a bonus! I did my own cauliflower rice in the food processor. After cooking it for 2 mins i squeezed out the cauli moisture. Cooked chicken breasts and cut them up . Tasted awesome and will def be making this again. this recipe was great! i used frozen cauliflower rice from trader joe’s. also added black beans (drained) and green chilies. so yum! How do the tortillas come out? I’m wanting to use this for meal prep and I’m worried they may just get soggy. Hi Courtney! 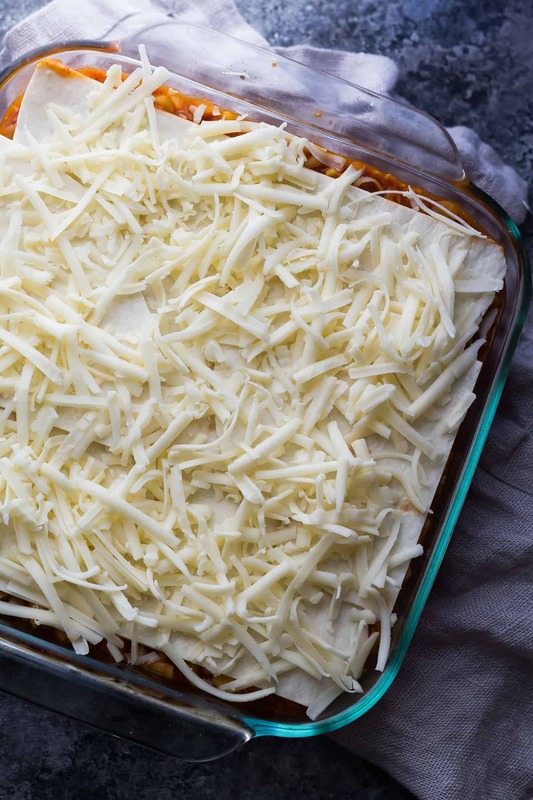 This casserole keeps for 2-3 days in the fridge. The tortillas will get a little bit soggy but it didn’t bother us. I need help finding the Cauliflower cauliettes! I live in Georgia(USA) hopefully you can help me. Here’s a list of stores that carry Mann’s products, however if you can’t find the cauliettes, I have had some readers use regular cauliflower rice with success. You can even make your own with a food processor! Hi Laura, it should be good for up to 4 days! Made this yesterday using cauliflower rice. It turned out great and was delicious! I was afraid the cauliflower would be too soft since it was riced but the texture was great. Plenty of bite left in it. I got a food processor for Christmas and practiced using it today with cauliflower! I was looking for things to make with it and came upon your recipe. Would this recipe work with cauliflower rice instead of small chunks? I hope you LOVE your food processor, Kristen! I think it should work the same with smaller chunks, but I can’t say 100% for sure as I haven’t tested. Where can you buy the cauliflower cauliettes? Hi Melissa, so sorry for the delay in getting back to you! Looks yummy! Can you tell me what temperature to bake this at? Thanks! Gosh how could I miss that important direction? It’s at 350…ammending the recipe. Thanks so much Kate! Can you freeze this and bake later? Or could you bake it and then freeze it? Hi Barbara! I haven’t actually frozen this recipe, but I think it would work. I’d freeze it unbaked, then bake up as written in the recipe. You can use any brand of cauliflower rice for this recipe, just make sure you cook it first. Let me know how you like it! Hi Cathy, I did a quick check on Spark Recipes for calories and it was 183 calories/serving (if you do 9 servings for one pan). That excludes any garnishes. I don’t know how to calculate points or anything so I’m sorry I don’t have any information about that. -4 still sounds pretty darn cold to me! I lived in Montana for a few years and it got that cold and I’m not sure I miss it very much! This looks like the perfect dish to warm you up though! I love that you used the cauiflower rice in here, such a great way to add more veggies! Oh maaaaaan, this is totally my kind of comfort food, Denise! I’ve never heard of that cauliflower product before but WHOA, my mind is blown! This casserole is definitely going on my future dinner menu! I hate wasting those stems too — this is a great way to use them! These cauliettes make life so much easier and I love all this cheesy goodness! Great idea! This looks fantastic! I am going to make this tonight. What brand of enchilada sauce do you recommend? Wow, for a healthy spin on a sinful dish-this takes the show! I wasn’t able to find that brand so used Frontera (Rick Bayless) enchilada sauce instead and subbed in corn tortillas for the flour but the rest was as written. It shall be a regular in this household, for sure! Thank you! Yay! I’m so glad you liked it, Mardy 🙂 Thanks so much for reporting back. Hi Denise. Love this, and appreciated the little video showing me exactly how, too (helps to see how the tortillas are placed!). What an ingenius idea to make something of the bits of cauliflower we usually throw away! Hi Helen! Yeah it’s definitely easier to show than try to write it out 🙂 Thanks so much! I thought it was cold in Chicago (high of 19 today) but you’ve got me beat! Although I think on Thursday it’s going to be 4 degrees, too cold, so that means I’m craving ALL of the comfort food and lots of hot beverages. I’ve never tried cauliflower rice before, but it’s on my list to do so. This casserole looks fantastic! I love the zesty flavors and my husband would, too! Oooh 4 ‘your degrees’ is pretty darn cold, LOL! I’m always trying to do the math with F and C degrees and just get confused. I hope you stay warm! 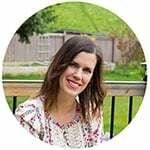 I just discovered your blog and am loving it!! Just wondering…any chance you have nutritional info for your dishes? Thanks so much, Pam! I don’t have nutritional information for my all of my recipes at this time, I plan on looking into this in 2017. I’d love to work with a nutritionist to provide the most accurate information, since I’m not an expert in this myself. I just plugged it into Spark Recipes and got 183 calories per serving, this does not include garnishes and is for a smaller portion. I usually use My Fitness Pal and trust their data more, but they seem to be down right now. My mouth is watering! This sounds and looks so delicious! Hi Stacy, I haven’t tested with frozen cauliflower and can’t say for sure without further testing. However if you blend up some fresh cauliflower in a food processor into small chunks, then cook it in a pan for a few minutes, it should work! Where did you get your cauliflower from, denise?